Today I’m going to walk you through the six main clues that you might be an internal dialogue overuser. Overuse Clue #1 – We’re repeating the same thing in internal dialogue as we’re also showing in dialogue or action. Each sentence we write should introduce something new to the story. It’s the concept of everything in fiction needs to be there for a reason and needs to move the story forward. When we repeat ourselves, in any fashion, it doesn’t move the story forward. So, for example, if we use internal dialogue to show a character thinking about how she wants to cry or how she wants to slap the person who stole her job, and then we show her crying or show her slapping, our internal dialogue and action overlap. Overuse Clue #2 – We have as much internal dialogue during a tense action scene as we do during a quieter reaction scene. When we want a scene to feel fast-paced, we need to use less internal dialogue overall. We don’t have as much time to think when our life is in danger or when we need to make quick decisions to prevent something bad from happening. If you find that you’re using the same amount of internal dialogue in what should be a fast-paced action scene, it could be a clue that you’re overusing internal dialogue. One of the main causes for this is if we haven’t laid the groundwork well enough prior to this scene. In other words, we’re partway into our fast-paced scene and we realize that the reader doesn’t yet know a key piece of information. We start adding to the scene to make sure the reader isn’t confused. Fast-paced action scenes aren’t the place for that. If we figure out we’re missing some foundational pieces, we should backtrack and add as many of them as we can prior to the action. Overuse Clue #3 – We’re using internal dialogue to sum up our scene at the end or forecast what’s coming before the scene starts. When we forecast through internal dialogue, we’re often hoping to hook the reader. When we sum up our scenes at the end, we’re often hoping to remind them of what’s just happened so they’ll carry it with them into the next scene. Neither are necessary. Both indicate that we’re overusing internal dialogue, and it’s time to make some hard cuts. Before I move on to the next point, I want to clarify the difference between foreshadowing and forecasting. Some writers think that what they’re doing is foreshadowing when in reality it’s forecasting. Foreshadowing is a good thing. In foreshadowing, you drop subtle hints for the reader of what might be coming in the future (e.g., your main character notices something just in passing that becomes important later in the story, or you show your main character’s ability to tie knots and that ability will be crucial in the climax). In forecasting, you tell the reader what’s coming. Overuse Clue #4 – Within our internal dialogue, we’re repeating the same idea in multiple ways. Of all the overuse clues, repeating the same idea in multiple ways can be the trickiest to spot because it’s a balance issue. It’s easy to confuse with developing a character’s internal situation during an important moment. Here’s what I mean by that. When something extremely important happens to our point-of-view character, we need to spend more time on their reaction to it. Where we often stumble, though, is that each sentence in that reaction needs to show progress rather than wallowing in the same ideas, phrased differently. Allow me to show you an example. How could he have done this to her? She felt like she was trapped in a bad remake of Shallow Hal where it turned out Hal didn’t care about Rosemary after all. Only the lowest level of slimeball pretended to be someone’s friend just to get a leg-up on a promotion at work. It was as bad as dating the boss’s daughter to get ahead. Using any kind of relationship for the sole purpose of bettering yourself in a job was unethical. Are you tired of hearing the character think about this yet? When we don’t introduce anything fresh, the reader quickly finds the character’s thoughts boring. It’s like when someone tells you the same story every time you talk to them. After a while, you cringe inside when you know they’re about to start up again and you tune them out. Don’t let this example lull you into a false sense of security, though. Maybe we don’t have our character think about the same thing in different ways within a single paragraph, but we have them think about the same thing at different times throughout the story. If our character is thinking about the same thing without making progress in either her emotions toward the situation or how she wants to handle the situation, or in finding evidence to either prove or disprove what she believes, then we’re overusing internal dialogue. Our character can think about the same event, but each instance of internal dialogue needs to show progress of some kind. Overuse Clue #5 – Every paragraph focused on the POV character includes internal dialogue. Not every paragraph that focuses on the point-of-view character needs to include internal dialogue. Not every line of dialogue by the POV character needs to be preceded or broken up by internal dialogue. If you have a large chunk of internal dialogue in every other paragraph, that can be a clue that you’re overusing it. Do you struggle with too much or too little internal dialogue in your fiction? Internal Dialogue: A Busy Writer’s Guide is now available! You can grab a copy of Internal Dialogue: A Busy Writer’s Guide from Amazon , Kobo, Barnes & Noble, or Apple iBooks. It’s on for $2.99 (at Amazon) only until the end of this week to celebrate the release! As you might have noticed from the comments last time, when it comes to internal dialogue, the most common question is “how do I format it?” It’s easier than you think. The answer depends on what point of view you’re writing in. As you might have guessed, this clarity and ability to put thoughts in present tense while writing in past tense is one of the often overlooked advantages of writing in omniscient POV. You have options if you’re writing third person point of view but aren’t bringing it to the intimate level of deep POV. Because we’re in third person point of view, we’ll already know that any thoughts are Melody’s so we don’t need the “she thought” of omniscient POV. The italics clue the reader in that we’re now hearing Melody’s exact thoughts. The italics also allow you to use present tense thoughts in an otherwise past tense story if you want, without jarring the reader. If you choose to give the thoughts in present tense, just remember to be consistent throughout and, whenever possible, set them off in their own paragraph in the same way that you would dialogue. You don’t have to add the action beat in front of the internal dialogue to make it work without italics, but I wanted to show you that it sometimes helps to ground the reader. Also, if you don’t use italics, you should keep it in past tense (assuming the rest of the story is in past tense). You don’t need italics or any other signal. You’re deep inside your character’s head, and your reader will understand that what they’re reading is what the character is thinking. The trick with this is that, to maintain consistency and keep from jarring the reader, you must maintain a consistent tense. You can’t be switching to present tense in your internal dialogue if you’re otherwise writing in past tense. No matter what point of view you’re writing in, never, ever use quotation marks for internal dialogue. Quotation marks signal spoken dialogue. 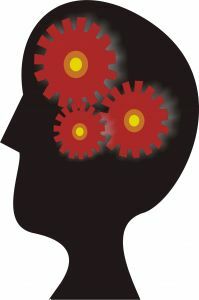 What do I do if I’m writing a paranormal, fantasy, or science fiction story and people can speak telepathically? This is actually the trickiest of all because now you’re juggling externally spoken dialogue, internal dialogue where the character is thinking to herself, and head speak where two characters are speaking privately in their minds. Here’s what I recommend to keep it all straight. Use quotation marks for normal dialogue spoken out loud. For inner dialogue where the character is thinking to herself, don’t use italics or tags. Keep the tense consistent, and format it the way I showed you above for deep POV (third person). For head speak, use italics. The first time this happens, you’ll need to use a tag or signal to the reader somehow that they’re talking in their heads. Once you establish that italics mean “we’re talking telepathically,” the reader will assume that’s the case every time they see italics. This is why you can’t then also use italics for inner dialogue where the character is thinking to herself. So for the sake of demonstration, let’s assume Ronald and Melody from our example are telepaths now, and they’ve met up with a third character named Edgar who owns a classic space cruiser that Ronald desperately wants to buy. Ronald took my hand. Loan me the money? he asked telepathically. I’ll pay you back. Liar. Where was the $1000 he still owed me? I’m maxed out this month. You’ll have to ask your sister. Not the best written example, but it gives you an idea of how it would look. Do you have any more questions about internal dialogue? Do you prefer to see it with or without italics? Want to learn more? 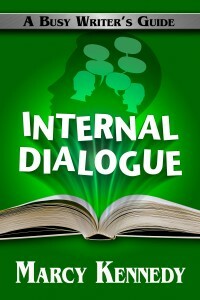 Check out my book Internal Dialogue: A Busy Writer’s Guide ! So welcome to the first in a three-part series on how to handle the voices inside your characters’ heads. First we need to make sure we’re clear on what we mean by “inner dialogue” and how to tell good inner dialogue from bad. The simplest definition is that inner dialogue is what your character is thinking. However, because the definition is so simple, a lot of writers get confused about the difference between the character thinking naturally to themselves and a character narrating for the benefit of the reader. Inner dialogue is not narration. The movie starts with a voice over as we see a little girl and her father on a bridge with the sun setting in the background. Okay, there are two things I remember about my childhood. I just don’t remember it being this orange…First, I remember being with my dad. He’d get this far away look in his eyes and say, “Life doesn’t always turn out the way you planned.” I just wish at the time I’d realized he meant my life. Lucy, the main character, is talking directly to us. It’s narration. This is what we want to avoid. (Yes, there are exceptions, but that’s another post about good narrative vs. bad narrative.) We don’t want it to feel like the main character is talking at us. 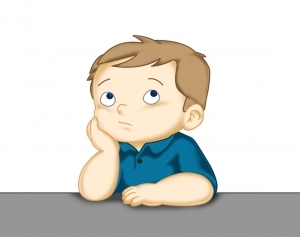 It tends to come across like a lecture, and lectures are boring. And, more importantly for the issue at hand, it’s not inner dialogue. Instead, inner dialogue should feel like we’re eavesdropping on our character’s thoughts to herself. Forty-five dollars for a Christmas tree and they don’t deliver? You order $10 worth of chow mein from Mr. Wong’s, they bring it to your door. Oh, I should have got the blue spruce – they’re lighter. In a novel, this would have been given to the reader as Lucy’s thoughts. That is internal monologue, and it’s amazing when done well. Rule #1 – Only use inner dialogue for the point of view character (unless you’re writing in omniscient POV). If you introduce inner dialogue for a non-POV character, it’s head hopping, one of the worst point of view sins. But If It Follows These Rules, Does That Mean It’s Good? If your inner dialogue follows these two rules, it still needs to pass the three question test in order to be deemed good. If it fails, you need to either rewrite it or delete it. Would my character think this? Do you normally mull over the color of your carpet? I don’t. I also don’t think about the color of my best friend’s hair (because I’ve seen it so many times). I don’t think about the sound my truck makes or even what route to take to get home. If your character doesn’t care about it, they won’t think about it. If your character wouldn’t think about it, it’s a point of view error. You can’t try to sneak in information through inner dialogue, no matter how important you think it is. Is this the way they’d think it? If your inner dialogue passes the first test, you still need to ask if they’d think about it in the way you’ve written it. Let’s say I would be thinking about my truck because it starts to make a strange noise while I’m driving home. I’m likely to worry about whether I’m going to get stranded on the side of the road in the dark. Or about where we’ll get the money for repairs if something is wrong. If my dad is driving my truck and hears a strange noise, he’s going to describe it in words I’d never think of (a rattle, a grind, a whine, a screech), and he’s going to think about what the causes could be. He knows the parts of an engine or the breaking system. But it goes further than this. What tone would they use in this situation? And remember all those questions we asked when talking about making dialogue unique to your characters? They apply to inner dialogue as well. Would they be thinking this now? Context is everything. On a normal day, I might hear that noise and think about it. If there’s a man with a gun in the seat next to me, I’m not going to think about that noise unless there’s a way I think I can leverage it to get away. 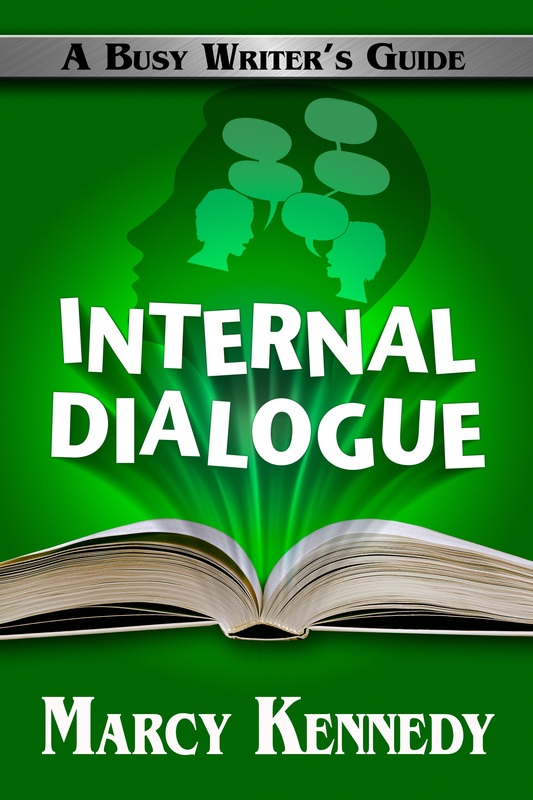 If you have questions about internal dialogue, now is the time to ask them. I can always extend the series. Do you struggle with inner dialogue?